Put your feet up and fall asleep in this gorgeous Homitt Portable Camping Hammock! Great to lounge in and enjoy a spot of quiet time, this travel hammock will help you relax in your trip! This double parachute hammock is well constructed with heavy duty Nylon Fabric material and triple stitched craft. Especially the ends of the hammock are very durable and without a doubt support 2 adults swinging back and forth on it. 275CM x 140CM (9.02FT X 4.59FT) practical size enable you have enough room. You can lay yourself in, stretched out, width wise with ample space for two people. However, the outdoor hammock takes up the same amount of space as a large water bottle, and it's very light. 1. 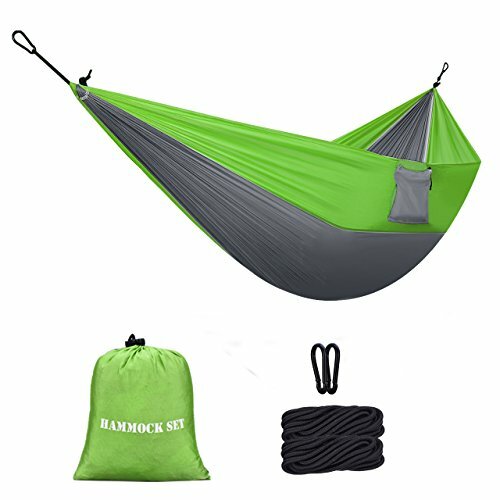 The hammock can be used when you have a trip like camping, backpacking, long hiking and other outdoor trips; you can also use it at the beach, mountain, wood, or your backyard, your room. It is also best choice when you have a motorcycle trip, car trip, etc. Soft and Comfortable Nylon Fabric Material: This portable hammock was crafted with 100% high strength breathable nylon fabric, which is light weight but strong, quick drying but machine washable. 2 * 6.56FT Tree ropes and Carabiners included for hanging. Reliable Weight Capacity: 700 lbs weight bearing capacity can easy hold 2 people. Reinforced Triple Stitching at the joints makes this nylon double hammock hard to rip. The stuff sack is attached so you won't lose it. Endure to last years! Easy to Setup in Minutes: So easy to set up the hammock in minutes without any tools. Perfect for beginners or experience campers. Portable and Lightweight: The hammock for camping is about as heavy as a rain jacket and the bag that everything is housed in is small and lightweight, excellent for carrying along or placed in your backpack.